You got the tickets. You went to the game. You took the pictures. Perhaps there were even hotel, airline, and rental car expenses? It may have been the single greatest sporting event you ever attended. Your friends and family are jealous. 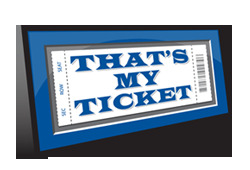 Enter the Ticket Frame from That's My Ticket the perfect item for capturing the experience and memory of being there. With your game ticket as its centerpiece, the Ticket Frame combines every aspect of attending a sports event. The headline and sub-headline trumpets the game's significance. The officially licensed 8-by-10 game photo spotlights the key on-the-field moment. The 400-word game summary illustrates the day's newsworthy events and includes post game quotes from the individuals who made history. The TMT composite stat box highlights all the game's scoring and action. And, your Ticket Frame gets personalized by your 4-by-6 photo; thus you not only get to relive the memory of the game, your Ticket Frame allows you to relive your experience at the stadium.